When in 1887 Beeton’s Christmas Annual included a story about a brilliant consulting detective written by an obscure doctor living in Southsea, Portsmouth, nobody could have predicted the massive influence Sherlock Holmes would have on the world of detective fiction. Perhaps that’s why the cheap book bound in fragile paper wraps was discarded by so many Victorian households after the Christmas season was over. Famously, there are just 34 copies still in existence, of which 11 are complete, making the prospect of owning an original virtually impossible for the Sherlock Holmes collector. Drawn from limited edition reprints whose copyright has now expired, this unlimited edition contains all the pages of the original edition. Including the original adverts and the accompanying works, this book is a fascinating historical document – and an affordable choice for the lover of all things Sherlock. £10 to Rest of the World, including USA, Canada, Australia, Japan, etc. ‘I just got my copy. It looks great. Highly recommended for Sherlock fans.’ – Neil Gaiman, novelist, comic book writer and screenplay writer. Few of us will ever have the chance to handle the real thing. 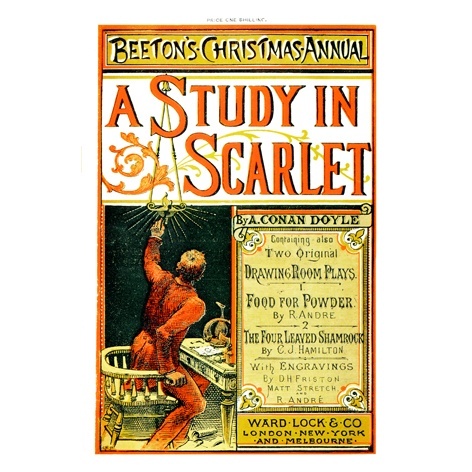 The 1887 Beeton’s Christmas Annual, containing the first appearance of Sherlock Holmes and Dr Watson in Dr Arthur Conan Doyle’s first published novel, A Study in Scarlet, is a precious rarity: of the thousands that were sold at railway bookstalls and the like, only eleven complete copies are known to exist. In 1960 a nice facsimile edition was jointly published by the editors of The Baker Street Journal and The Sherlock Holmes Journal , and in the centenary year of 1987 John Gibson produced an even better facsimile – but both, understandably, were issued in strict limited numbers, and have themselves become scarce collectors’ items. What the Portsmouth publisher Matt Wingett has done – for which he will long be honoured – is to make a really good Beeton’s facsimile available at a mere £15.00 and in potentially unlimited numbers. Collectors may gloat over their Smith-Donegall Beeton’s or their Gibson Beeton’s; but the Wingett Beeton’s can safely be both cherished and confidently recommended to all, in the certainty that anyone who is really interested will be able to afford a copy.